Reports: Dodgers, Brandon McCarthy closing in on 4-year deal. The Dodgers and free agent right-hander Brandon McCarthy have agreed to terms on a four-year contract, according to multiple reports Wednesday. The 31-year-old is 52-65 in nine major-league seasons with the White Sox, Rangers, A’s, Diamondbacks, and Yankees. While not a star, McCarthy would boost a starting rotation that was down to three after the Dodgers traded Dan Haren to Miami on Wednesday. That trade is not official yet, but signing McCarthy is a strong indication that the Dodgers are seeking immediate help. 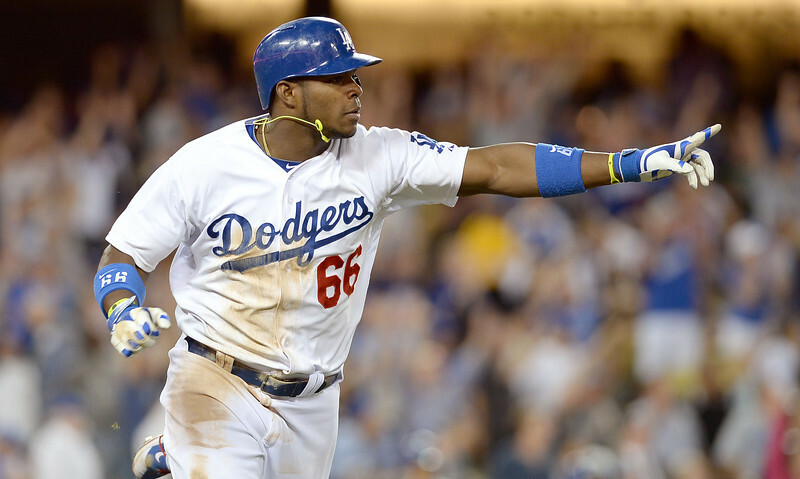 Daily Distractions: On further review, Yasiel Puig isn’t focused on being more patient this year. One thing left on the chopping block from my story on Yasiel Puig’s sophomore surge is something I didn’t expect to hear from Mark McGwire. I expected that the Dodgers’ hitting coach would have talked to Puig about being more patient at the plate this season. Like, a lot. FanGraphs recently pointed out that Puig is one of six players who has dropped his percentage of swings on pitches out of the strike zone by more than 10 percent from one season to the next. It’s not a thing we talk about a lot. He understands it. We talked about it a lot last year. The biggest thing is learning how this game is played here. To me, the more patient you are, the more the pitches are going to come to you. 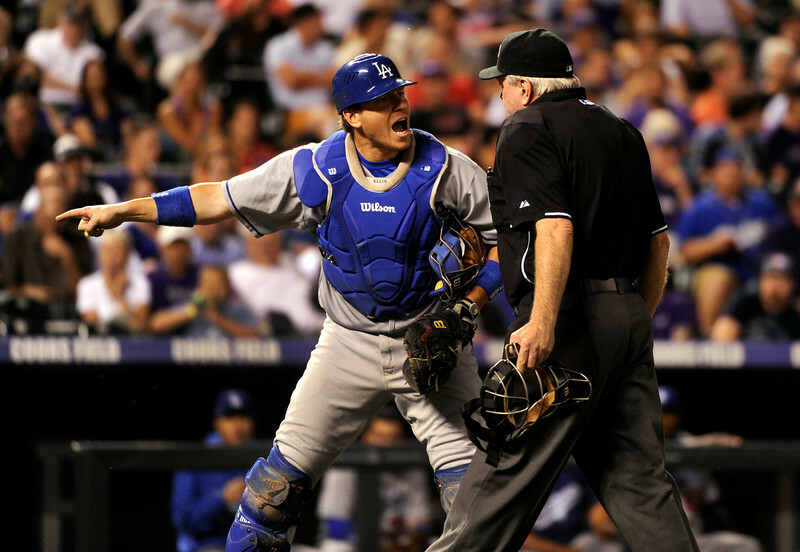 The more impatient you are, the more the pitchers are going to go away from you. He got a lot of that in the second half of his season last year up here in the big leagues. The time that you cover 17 inches is the when the baseball looks like a beach ball. you have the confidence like, ‘it doesn’t matter what you throw, if it’s over the white part of the plate, I’m going to kill it.’ Then there’s times where you have to pick one side of the plate or the other. Most pitchers today live away. Some pitchers live in. It’s just pick or choose, based on who’s on the mound. Me and John Valentin have a chart and things that we talk about prior to each series. We talk to the hitters as they go up to the plate, what to expect, this is what to do, where they usually live. Daily Distractions: April Dodger Pride award winners include a couple top prospects. The end of the month is always a good time to check in on the Dodgers’ farm system, because a good month comes with an award. The Dodger Pride Awards were created in 2008 by GM Ned Colletti to reward one pitcher and one position player at each level of the system “who play the game with a hustling, smart, aggressive style.” The players and staff on each respective club vote for the monthly awards. Pitcher: Henry Sosa posted a 1-0 record with a 2.61 ERA (9 ER/31.0 IP) in April, striking out 21 batters against seven walks in five starts. The right-hander held opposing batters to a .233 batting average (27-for-116), while allowing only one home run in the month. The 12-year professional, who made 10 starts for the Houston Astros in 2011, was signed by the Dodgers as a free agent on December 13, 2013. Player: Joc Pederson finished April among the Pacific Coast League leaders in several offensive categories including batting average (.398, 2nd), runs (22, T-3rd), hits (39, 1st), home runs (6, T-3rd), and stolen bases (9, T-2nd). On the year, the left-handed hitting outfielder is batting .368 (50-for-136) with 11 home runs and 22 RBI, including a .418 batting average (38-for-91) against right-handed pitching. Through 36 games this season, Pederson has also tallied 15 multi-hit games, including six performances with three or more hits. He entered 2014 as the Dodgers’ No. 1 prospect according to Baseball America. Pitcher: Tyson Brummett went 2-1 and allowed only one run in 23.0 innings spanning four April starts, leading the Southern League in ERA (0.39) and ranking sixth in opponents’ batting average (.181). On the season, the former UCLA pitcher is 3-3 with a 0.83 ERA (4 ER/43.1 IP) and has allowed one run or less in six of his seven starts for the Lookouts. With runners in scoring position this season, the right-hander has allowed only four hits (4-for-36), good for a .111 batting average. Brummett signed with the Dodgers as a free agent on February 20, 2014, after being drafted by the Phillies in the seventh round of the 2007 First-Year Player Draft. Player: Scott Schebler drove in 16 runs (T-7th, Southern League) and clubbed five homers (T-2nd, Southern League) in 25 April games. The Iowa native had a .258 batting average with six homers, four triples and 21 RBI, and has excelled in clutch situations, batting .300 (9-for-30) with runners in scoring position. The 23-year-old, a 26th-round draft pick in 2010, was the Dodgers’ 2013 Branch Rickey Minor League Player of the Year after batting .296 in 125 games for Single-A Rancho Cucamonga last season. Pitcher: Matt Shelton went 1-1 in April with a 1.76 ERA (3 ER/15.1 IP) in eight appearances for the Quakes, limiting opponents to a .228 batting average (13-for-57) and pitching scoreless relief in seven of his eight outings. The Texas native struck out 14 batters and walked only one in April before being promoted to Chattanooga on May 1. The 25-year-old was selected in the 24th round of the 2011 draft. 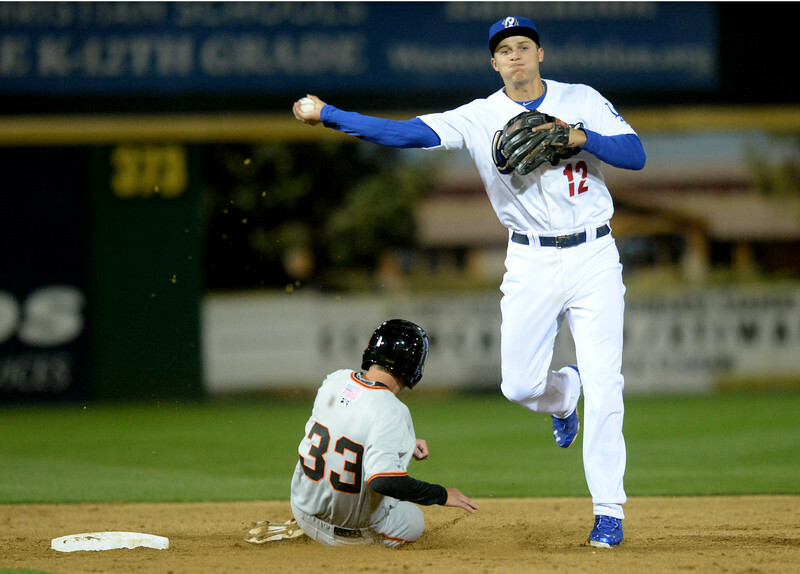 Player: Corey Seager batted .294 (25-for-85) in April with 10 extra-base hits, while tallying 13 RBI in 20 games. The 20-year-old has raised his average to .333 (40-for-120) with two homers, 11 doubles, two triples and 15 RBI, batting .429 (15-for-35) with a .512 on-base percentage in nine May games. Seager entered 2014 as the Dodgers’ second-best prospect according to Baseball America. Pitcher: Michael Johnson posted a 1-1 record with a 1.35 ERA (2 ER/13.1 IP) and a save in eight April appearances. The right-handed reliever limited opposing hitters to a .200 batting average (10-for-50) with 19 strikeouts and five walks. On the season, the Massachusetts native has a 1.47 ERA (3 ER/18.1 IP) and 22 strikeouts in 11 appearances for the Loons. The 23-year-old, a 14th-round pick in the 2013 draft, led the Ivy League with seven wins as a senior at Dartmouth College in 2012. Player: Joey Curletta had a terrific April, finishing among the Midwest League leaders in batting average (.368, 2nd), runs (18, T-3rd), hits (39, 1st), doubles (9, T-3rd) and RBI (15, T-6th) in 25 games for Great Lakes. Overall, Curletta has posted a .356 batting average (52-for-146) in 35 games, second among Midwest League hitters, and has seven three-hit performances for Great Lakes. The Arizona native was selected by the Dodgers in the sixth round of the 2012 draft. Daily Distractions: A scout’s take on Erisbel Arruebarrena. Infielder Erisbel Arruebarrena is batting .136 for the Dodgers’ Double-A affiliate. Erisbel Arruebarrena provided a nice distraction during spring training. 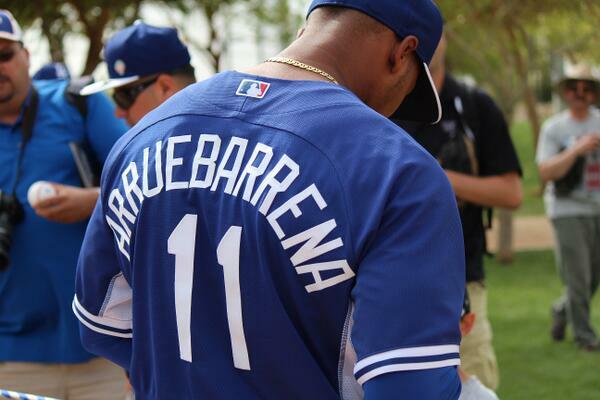 Reporters covering the Dodgers spent countless minutes rolling our “R”s, trying to pronounce Arruebarrena, figuring out how many “U”s were in the name, and mostly waiting for the 24-year-old shortstop to arrive in the U.S. When he finally did get his visa and arrive in spring training on March 13, the Cuban shortstop was shuffled to the Dodgers’ minor-league camp. Then the major-leaguers left for Australia. Hardly anyone got to see the kid play baseball. Nearly two months later there he is, taking up a space on the 40-man roster and $25 million of the Dodgers’ payroll over the next five years. Ever since Arruebarrena reported to Double-A Chattanooga, he’s proceeded to bat .136/.188/.220, which hardly seems to justify a $25 million contract. Was this signing a mistake? Was rolling my “R”s one big time-killerrrrrr? A pro scout who recently watched Arruebarrena in the Southern League chimed in with this report. I’d say Erisbel’s current offensive numbers are an accurate representation of his abilities – he has a long/loopy swing, almost like a golf swing that struggles to make contact with any type of pitch. He has serious recognition problems vs. AA-effective secondary stuff, turning his back early & often vs. almost all curveballs/sliders. Those things combined lead to rare contact on mistake fastballs only, or if a pitcher makes a bad decision to throw him the same loopy curveball three times in a row. That said, him at SS is sometimes awesome to watch; way above instincts, really easy/super-quick receive-and-throw actions deep in the hole or going up the middle with a really good feel to complete very tough plays. He did flash a couple mental errors, like dropping a popup or ball bouncing off his glove with the infield in. Even with the bat how it is now I’d like to have him in my organization, because his floor is first-division middle infield-utility. As he gets comfortable over the next couple seasons in the US I think his feel/baseball IQ will improve a bit/less mental errors on both sides. I see him as a mid-.500s OPS guy but with major league top-5 shortstop defense. Make of that what you will. It’s the most up-to-date scouting report we have on a player we know little about, perhaps the least known member of the Dodgers’ 40-man roster.